This simple crisp doesn't need much time to bake since the fresh cherries are cooked first. We have adapted this recipe slightly from the original version in Prevention magazine. Put the pitted cherries, ¾ cup sugar, and ½ cup buttery spread in a large saucepan. Place the pan over medium heat and cook until the cherries are soft and tender. 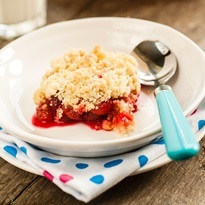 Using a slotted spoon, transfer the cherries to a 9x13-inch baking dish. In a medium bowl, whisk together the flours, remaining ½ cup sugar, and extract. Add the remaining ½ cup buttery spread and whisk until the mixture resembles coarse crumbs. Spread the crumb mixture evenly over the cherries. Bake for 12 minutes, or until the topping is golden. Serve warm with a scoop of dairy-free ice cream, if desired.